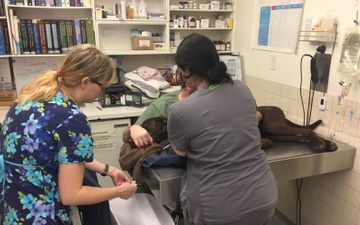 The Winnipeg Animal Emergency Hospital has provided the Winnipeg Humane Society with after-hours emergency veterinary care for more than 30 years. Their exemplary care has been critical to saving lives and we could not have helped as many animals without their support. The staff at the WAEH is very caring and professional and are there for us 365 days a year." Dr. Erika Anseeuw B.Sc., M.Sc., D.V.M. The Winnipeg Animal Emergency Hospital (WAEH) opened in 1974 as the first 24-hour animal care facility in Manitoba. It is located in the heart of Winnipeg at 400 Pembina Hwy and works in conjunction with Pembina Veterinary Hospital to provide 24/7 emergency and critical care for your pet. Our doctors, technicians, and hospital staff are committed to providing the best service and care for patients referred to us by clinics throughout Manitoba and nearby Ontario. Being pet owners ourselves, we understand the bond between people and their animals. Our 24-hour animal hospital in Winnipeg offers a wide range of services including surgery, emergency dentistry, orthopaedics, endoscopy, diagnostic imaging and ultrasound. Upon discharge from the hospital, all medical records and recommendations associated with the case are promptly forwarded to the primary care clinician, enabling effective and accurate follow-up patient care from your regular veterinarian. Starting January 1st, there will be no after-hours fee charged with the examination before midnight. You will be charged an examination fee for the veterinarian to do a full physical examination and if your pet requires any further treatment or diagnostics, you will receive an estimate.